Tickets for Johnny Utah's New Years Eve 2020 are currently not on sale. New York City’s Johnny Utah’s is the perfect combination of cowboy and city. Yes, it's an actual urban cowboy experience! The 6,000 square foot space located in close proximity to Rockefeller Center and Fifth Avenue provides authentically Western-feeling fun right in the middle of Manhattan! Housed in a former bank, the colloquially dubbed "Utah's" decor emulates the ole' West in more ways than one. With exposed columns, towering ceiling beams and its most well known asset, the enormous mechanical bull centerpiece, this is no ordinary New York City restaurant. After all, no other restaurant can claim they have a bull -- this is Manhattan's one and only! Candlestick lighted and vaulted lampshades light the room as well sand western art adorns the walls. Whether you're named Johnny or not, there is no doubt you will truly feel like you're in Utah here. This is the closest thing to a real saloon that you'll find… well, other than a real one. It's a Wild Wild West type of joint. If you're looking for a literal East meets West urban cowboy experience this New Year's Eve, there is literally no more perfect spot for you to celebrate than Johnny Utah's! You can ring in 2019 in your cowboy hat… and heels! What could be a better combination than that? A ticket to Utah's awesome bash will get you five hours of delightful premium open bar - you can choose from a selection of down-home drinks like beers galore, wines or cocktails! Down those drinks, y'all! And while you're at it, enjoy a bite from Johnny's mini buffet station. Trust us, you will not starve in the good ole' West. Those Westerners love to dance… and so do you! Dance the last night of 2018 away as a live DJ spins hits all night long! The beats will be pumping from today's pop to tomorrow's hits, and of course, some good old country Western mixed in there too. Well, just a little maybe. 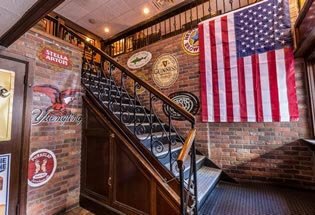 While you relish in down-home fun, reap the benefit of Johnny's central New York City location, just blocks from the famed Times Square ball drop. You can countdown to 2019 and watch the ball drop on a televised broadcast from right where you are inside! And of course, toast to the new year with a champagne toast at midnight! So whether you opt for cowboy boots, a cowboy hat, stirrups or just plain old city chic, saddle up and get your tickets to this not-to-be-missed New Year's Eve bash now. Dress code is festive (or Western wink wink) New Year's attire. 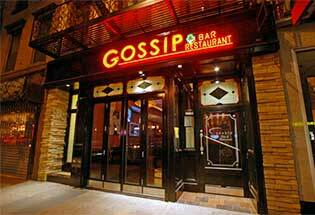 Gossip offers more than just your average 'round the corner Irish Pub feeling. 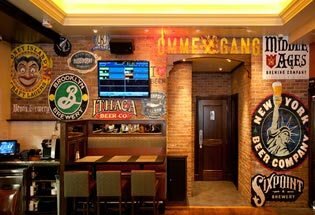 The sprawling pub’s decor celebrates authentic New York flavor.